Capture the architectural splendor of Las Vegas, USA, with this magnificent LEGO® Architecture Skyline Collection set that brings to gether the iconic Bellagio Hotel, Luxor Hotel, Encore Hotel, Stratosphere Tower and the Fremont Street Experience, in an inspirational skyline setting. Each individual LEGO model provides a unique and rewarding building experience with realistic color and relative scale depiction. A colorful Welcome to Las Vegas sign and a “Las Vegas” nameplate add the finishing touches to this detailed recrea tion of one of the world’s most vibrant cities. Price is 47% below the initial Lego retail price, a € 23.30 discount! This comes down to 5.33 cent per brick. 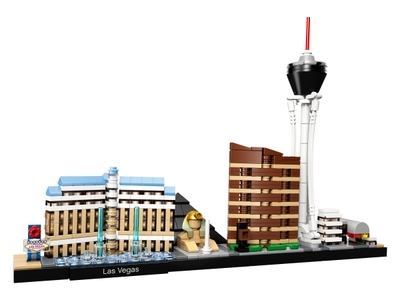 The Las Vegas (21047) Lego set is available from the sites below. However, they do not offer delivery to your selected region. The Las Vegas (21047) Lego set is no longer directly available from the sites below. However, 3rd party partners of these sites might still have the set available. Alternate description Celebrate Las Vegas with this LEGO® Architecture Skyline set! The included booklet contains information about the designer, architecture and history of each structure, as well as historical facts about Las Vegas and its architectural heritage.